Looking for promotional giveaway but not sure what is suitable? Finding a giveaway suitable for females? Wanting to provide a giveaway for your product? Wait no further because the answers are here! 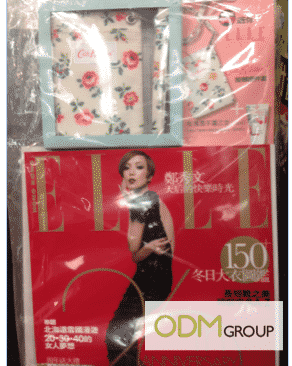 This month, Cath Kidston is collaborating with Elle Magazine to include their pouch in this month’s giveaway! Elle Magazine is one of the leading and well-established female magazines. Readers range from early twenties to late forties. Cath Kidston is another leading fashion brand established in London. Both have extremely positive success and global reach, they have come together this month to offer a giveaway. Magazines usually offer giveaways to entice customers to purchase. It is to attach new readership by rewarding the readers with a useful and practical gift. It also increase the perceived value of the product. Thus, the new readers would be attached because it seems like they receive more than they paid for. Not only so, the brand, Cath Kidston, also benefits from this giveaway. As the readers of Elle magazine are the same as the target clients, the magazine is a perfect platform for them to market themselves to the end clients. As such, they are able to increase the success of promoting themselves to the customers. Lastly, the magazines also benefit from this giveaway. Existing clients of Cath Kidston are more likely to purchase the magazine for the giveaway. This would increase the sales of the magazine then. Also, as the giveaway is branded with an established brand name, the perceived value of the goods will increase. As a result, this would attract people to purchase the magazine and increase sales for the magazine itself. Magazines collaborating with other brands are a popular marketing move by many. Here are some of the magazines and their giveaways. Cook Up a Storm with this Promo Gift! Sweet Magazine Cover Mount Gifts – Snoopy Tote! So, contact ODM today for more information!